We are delighted you have chosen the University of California Berkeley for your summer studies. Please carefully read the Berkeley Summer Sessions website, which is full of important information regarding courses, registration, fees, deadlines, change/add/drop courses, refunds appeals, housing and much more. If you still have questions, the Summer Sessions team is here to assist you. Register for classes, drop/add courses, cancel registration, change grading option, change your transcript address. Review grades, registration, class schedules, financial aid, the General Catalog. Create a CalNet ID and PassPhrase for use to enroll. Access dozens of campus services, and use as a debit card for use at on & off campus eateries, and on & off campus merchants. 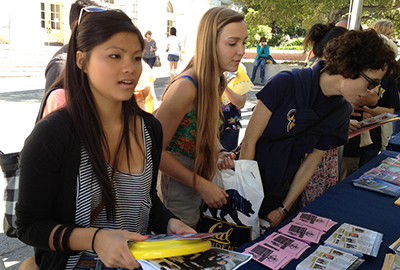 Explore the campus, get to know students and faculty, discover life at Berkeley.